I've been using Centered Systems Second Copy 2000 to manage the backups on my home network, and to an offsite server, for years. For the offsite backups I use the "autodial" feature in Second Copy, that configures a profile to "dial" a connection, such as a VPN connection. I recently upgraded to Windows 7 from Windows XP, and when I ran my profiles, Second Copy crashed with the message "SecCopy has stopped working". After some experimentation I narrowed this down to the profile that was using the autodial feature. If I disabled the autodial, and connected to the network manually from outside of Second Copy, then the profile would run fine. I sent a message to Centered Systems support, but didn't get (or missed) the reply. I bought a license to Second Copy 7.1 hoping that this addressed any Windows 7 compatibility issues. But I got exactly the same problem there. I am now successfully using the following workaround. 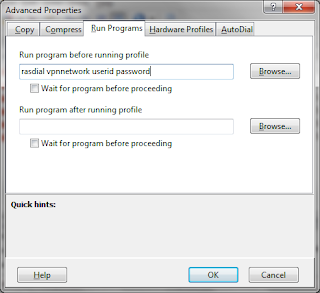 Instead of using the autodial feature, I am using the run programs feature. This lets you specify a command line to be executed before or after running the profile. I am using the rasdial command line to connect to the network. Credit to Jon Galloway's article on "Easier VPN Connections from a Windows Desktop" for the command line parameters.